Successfully Added Elephone W2 Smart Watch – Free Android App, 30ATM Water Resistant, Fitness Trackers, Bluetooth (Silver) to your Shopping Cart. Get more active, improve your sleep and make sure you don’t overwork yourself at the office with an accessory that is beautiful, sophisticated and smart. The Elephone W2 is a waterproof smartwatch that comes with Bluetooth 4.0 and a free Android app. Heading outdoors in the rain or can’t live without watersports? No worries – the Elephone W2 is 30ATM waterproof and can follow you for any adventure. Bluetooth 4.0 makes sure that your communication with other Bluetooth-enabled devices is quick, smooth and efficient. The smart watch comes with a free app for Android that you can download the Play Store. Simply get the app for your phone and see the watch sport even more functionality.. If you are on a track to a healthier life, the Elephone W2 smart bracelet will be of great help. It comes with a Sleep Monitor to make sure you get a good night’s sleep, fitness tracker to monitor your exercising progress and a Sedentary Reminder to let you know when it’s time to get off your chair and stretch a bit.. In addition to being a great productivity and fitness device, the Elephone W2 is a fashionable accessory in its own right. While most smart watches come with a gadgetized look, the Elephone W2 focuses on elegance and class. The smart watch comes with a sapphire glass display and a leather strap. It also features an nice expansive round display – a true classic. . 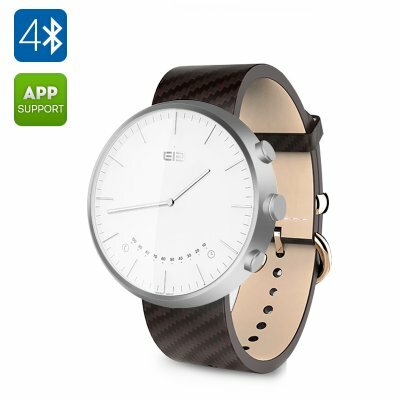 The Elephone W2 Smart Bracelet and Watch comes with a 12 months warranty, brought to you by the leader in electronic devices as well as wholesale smart watches..